Housing for persons 62 yrs. or older, or disabled of any age.. This property is PARTIALLY subsidized through USDA Rental Assistance program. This property offers subsidy to 7 out of 27 units. With subsidy, your rent will be based on 30% of your income. 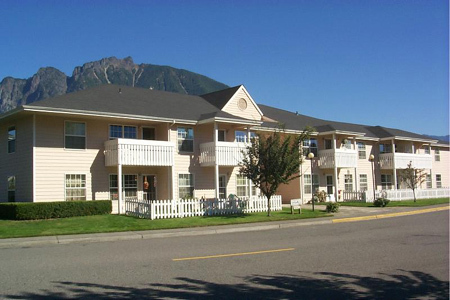 Located in the beautiful Snoqualmie Valley one block from the North Bend Senior Center. 27 one bedroom units with patio or deck. Mt. Si Community shuttle bus and Senior Center transportation available. We have a community room for resident functions and a computer center with high-speed internet available for residents and their guests. Laundry room and elevator. Income Limit Details: USDA Income limits up to moderate limit with preference for very low and low income applicants. Rent listed are our non-subsidized rental ranges. There is usually not subsidy available for new move-ins. However once a tenant, if you qulify for rental assistance you may be placed on a wait list based on income need. This property is PARTIALLY subsidized through USDA Rental Assistance program. This property offers subsidy to 7 out of 27 units. With subsidy your rent will be based on 30% of your income. Please call property for details. We accept Housing Authority provided Section 8 vouchers for our non-subsidized units.